TIP: You can save products to your favorites list if you log in Rwanda Rwanda, Help Help Rwanda, I'm sure the Beach Boys would be down with that. Agriculture and specifically high-quality, value-added coffee production are slowly bringing the country back from the nadir of the 1994 Genocide. At their best, like our washed Dukunde Kawa Cooperative offering, Rwandan coffees are stunningly complex and bright and rival the prized East African powerhouse coffees of Kenya and Ethiopia. Small-holder farmers (remarkably, approximately 80% WOMEN), whose plots are generally measured by the number of TREES/SHRUBS they tend rather than hectares, are well-served by co-ops like Dukunde Kawa, whose members creatively process funds back into healthcare, livestock investment and environmental protection. 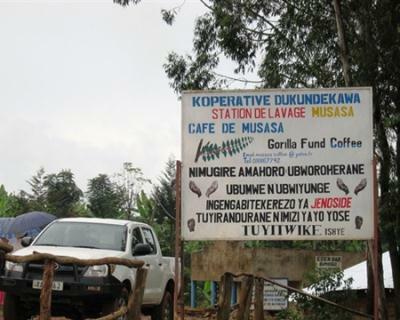 Operating since 2000, the co-op now has 4 wet mills and a dry mill in the Musasa area, located near a protected gorilla habitat in the Gakenke District. Hand-picking and –sorting of uber-ripe, predominantly Bourbon varietal plus extensive quality control at the mills ensures cup consistency. Growing elevations range from 1500-2000 meters and the Mbilima mill produced this lot. Producer-members have used earnings to improve their standards of living with investments in livestock, access to healthcare, and programs to protect the environment, which won the SCAA 2012 Sustainability Award. The quality of the coffee is also internationally recognized, consistently placing as one of the best in the Cup of the Excellence auction each year. Dry aromas are tantalizing and sparkly, and the cup evinces notes of vanilla, caramelized sugar, cherry cola and mandarin orange. 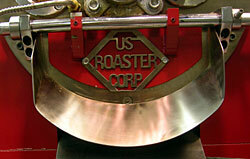 The lighter roast profile will make your pourover or dripper a happy place, especially accompanying a fruity dessert.